What role does furniture play in diplomacy? On the first day of the Istanbul talks, two podiums were set up on a stage in the press centre. Perhaps this was a sign that there would be a joint press conference at the end of the talks - suggesting progress. But by the second day, one of these podiums had been removed - perhaps a sign that the two sides would refuse to share the stage. Or perhaps the carpenters were just rearranging the furniture (one of the dangers of covering the minutiae of diplomatic talks is overinterpreting small details which may actually mean nothing). Negotiations are about issues. But they're conducted by people. That means that the little things matter: dynamics, choreography, and details (including furniture). This may be particularly important when it comes to talks with Iran. For 30 years, there has been a huge gulf of mistrust between Iran and the West. This gulf proved hard to bridge in just a couple of days of talks in Istanbul. So, when they met, Baroness Ashton walked with her hands firmly clasped behind her back - to make sure that her arms never brushed against his. As the two walked into the negotiating room, there was a small but noticeable reminder that many in Iran have lived a very different life from their counterparts across the table. Saeed Jalili walks with a slight limp - he was wounded in the Iran-Iraq war during the 1980s. The memory of this war, and America's support for Saddam Hussein's Iraq, is still vivid for many older Iranians. Iran still has no diplomatic relations with the United States. So, these talks were a rare moment of direct interaction between officials from the two states. There was some suggestion that Mr Jalili and Mr Burns might hold their own separate meeting in Istanbul. But this never came about. Instead, the Iranian delegation wanted to take advantage of the opportunity that these talks were being held for the first time in a mainly Muslim country. On the afternoon of the first day, Iranian negotiators attended prayers at the Blue Mosque in Istanbul. The Iranian state media showed pictures of Mr Jalili waving to onlookers as he left the prayers. This image appeared to deliver an important message - in this round of talks, Iran was in a familiar, friendly region. The West was not. Building on this point, the Iranian delegation continued its country's efforts to try to form alliances with Russia and China - the only other non-Western countries at the talks. "The Iranians are notoriously tough negotiators," said a US Administration official after the talks. "Clearly part of their aim was to test for splits in the P5+1 group." Among Western diplomats there was a sense of satisfaction that Russia and China maintained their alliance with the US, the UK, France and Germany. But this satisfaction was tempered by the realisation that the negotiations did not produce a breakthrough. For almost a decade world powers have been trying to talk to Iran about its nuclear programme. Now, following their lack of success in Istanbul, these countries have decided that they have nothing new to say or offer. 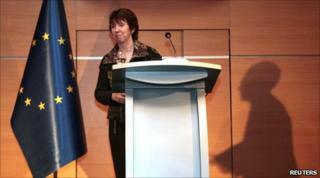 Catherine Ashton insists that it is now up to Iran to make the effort to respond.